In a new comprehensive research project, Psychiatric Center Copenhagen opts for a novel patient-care approach. With custom-designed light sources that will recreate natural light, researchers hope to be able to bring about a reduction in depression degree, duration of inpatient stay, and, the use of medication. Since 2014, a research team at Psychiatric Center Copenhagen, National Hospital of Denmark, headed by Klaus Martiny, Senior Consultant, Ph.D., Clinical Associate Research Professor, and Carlo Volf, Architect, PhD, has been focused on the influence of light on psychiatric patients’ recovery. In a recent study, the researchers demonstrated the duration of patients’ inpatient stay to be linked with the occurrence of natural sunlight in their bed rooms. Patients in the sunny, south-east facing, rooms were discharged considerably earlier than patients in the darker, north-west facing, rooms. These findings were published in the scientific journal, Neuropsychobiology. Hence, the research team has joined forces with Chromaviso, DTU Fotonik and Copenhagen Trial Unit in a comprehensive and interdisciplinary research project that is, as a first step, targeted at the product development of a new diagnose-specific lighting design for psychiatric purposes. Next, a randomised controlled clinical trial with a study population of 150 patients, will measure and document the influencing effect of light in the patients in terms of depression, sleep, duration of inpatient stay, the use of medication, circadian rhythm, and wellbeing. The project constitutes a natural next step in continuation of the well-known light therapy in which the patient is directly exposed to intense light for an hour. In the ROOM-LIGHT project, light will be an integrated element in the room and thus replace conventional lighting. ”We know that daylight exerts a positive therapeutic impact on humans suffering from depression. Light has an immediate mood stimulating effect. In addition, increased daylight exposure will also contribute to more alert waking states in the daytime, improved sleep at night and a more stable circadian rhythm. And precisely the circadian rhythm represents a major problem to patients suffering from depression,” Klaus Martiny continues. For the purpose of ensuring what in a psychiatric context is considered a good light environment, the project has developed entirely new and experimental lighting that combines equipment of high light quality with therapeutic and physiological effects. ”Thus, we have for instance developed a light fitting that will create a unique sensation of sunshine – the intention being that the patients will experience this as if, in the daytime, the sun will always be shining in their room, even on a dark and rainy day. We know that, in humans, sunshine will engender an instinctive reaction of wellbeing. For this reason, the project applies this excitant actively in order to achieve a psychological impact which is extremely important in psychiatry,” Carlo Volf explains. The project will ensure what practically amounts to a twofold increase in annual sunshine hours. We know that daylight exerts a positive therapeutic impact on humans suffering from depression. Light has an immediate mood stimulating effect. In addition, increased daylight exposure will also contribute to more alert waking states in the daytime, improved sleep at night and a more stable circadian rhythm. ”The light fittings are designed in new shapes and materials for the purposes of achieving a more homelike and less institutional appearance and, likewise, to ensure such comfortable room lighting as the patients will consider to be pleasant. For even though light will exert a physiological impact, it needs to be pleasant for the patients – to look at and to touch. Otherwise, they will simply switch it off,” Carlo Volf continues. The project’s therapeutic lighting will automatically change within 24 hours – just as the natural light outside. The goal is to recreate the beneficial effects of natural lighting, comprising the balance between subtle morning, bright daylight with many blueish hues, and evening warmth together with the dark of night. ”The rhythm of light is described in a lighting protocol adapted to psychiatric diagnoses, behaviour and the rhythm of the ward. The lighting protocol states the exact interaction between intensity, chromatic spectrum, timing and duration – depending on the time of day. This means that, to the patients, light will come to signify a time signal encouraging them to be alert at daytime and to sleep during night time. This will reinforce the patients’ circadian rhythm and enhance their perception of time,” explains Torben Skov Hansen, Head of Innovation at Chromaviso. In order to recreate this intervention for clinical use, detailed lighting measurements will be documented. ”By measuring and documenting precise light compositions, we establish evidence of e.g. the impact of spectral distribution on humans,” explains Paul Michael Petersen, Professor at DTU Fotonik. According to Carlo Volf, project perspectives are considerable, as daylight deprivation has become a condition of existence to modern humans – not solely to inpatients. ROOM-LIGHT is a research project conducted by Psychiatric Center Copenhagen established for the purpose of providing evidence within the area of light’s impact on patients suffering from depressions that will require hospitalization. Both the light fittings and light composition within the day’s 24 hours were specifically developed for this research project and for the purpose of recreating the beneficial effects of natural lighting during psychiatric hospitalization. 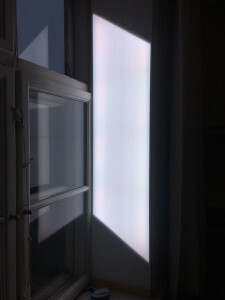 The project’s therapeutic light was developed in collaboration between clinicians and researchers from Psychiatric Center Copenhagen and lighting experts from the health science technology company, Chromaviso. The lighting is based on chronological knowledge about light’s impact on humans, insight into psychiatric patients and routines, combined with competences within circadian rhythm technology and architecture. The lighting will automatically change – like the natural light outside. It will gradually increase in intensity and slowly introduce its content of the blue hues, before it – once again – will become subtle and warm in the evening. During the night, patients will sleep in darkness, albeit – to enable them to move about – they will be able to switch on a night light, without the presence of blue. The project is a randomised clinical trial with an introductory pilot study of 15 patients (initiated in May 2017) in which e.g. light’s tolerability is investigated and optimised. Subsequently, the actual trial will be carried out in which, through intervention as well as control, a study population of 150 patients will receive standard lighting. The study will measure and document the light to obtain evidence of how the composition of light will affect humans – physiologically and therapeutically. As a spin-off benefit, the project light will also lead to a reduction in energy consumption. The development of a lighting protocol adapted to psychiatric patients: a fusion of light as to light intensity, colour spectrum, duration, and timing as regards circadian and seasonal rhythms. The development of new light fittings for the purposes of ensuring light quality, a home-like feeling, and high applicability.